Thanks for joining me this afternoon: Your texts, tweets and social media posts were much appreciated. There wasn't time to substitute Neymar in the end, by the way. He wasn't at his best, and Brazil were certainly not at their most attractive. But Dunga has restored their self-respect after an awful end to their World Cup. They're in decent shape for the Copa America. Chile play an energetic, high-temp game, but need to be better at creating chances with their possession. 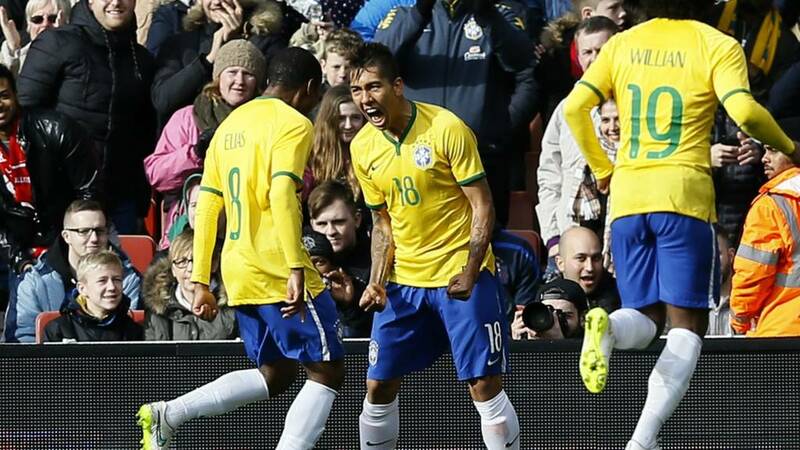 Brazil secure an eighth successive win. It was scrappy, it was untidy, and I'm not entirely sure it was deserved. By substitute Roberto Firmino pressed his claims for a starting spot with a very nicely-taken second-half winner. We're well into three minutes of stoppage time. Neymar, trying to salvage an afternoon of personal frustration, wins a free-kick just as Dunga is preparing to substitute him. The Brazil forward stays on the pitch to take the free-kick - it wouldn't be fair to take him off at that point - and he whizzes a shot that bends away at the last moment. Back to the action: Brazil's Robinho goes for a ridiculously spectacular volley from an impossible angle, and sends the ball squirting off in the wrong direction. Willian follows up by blasting a shot into row 13. We've got a hold-up now, caused by a handful of pitch invaders. The stewards are on quickly to deal with it, though. Where's the strangest place you've watched a match? Charlie Bayliss: Tavistock Town v QPR for a pre-season friendly. Ended up something like 9-0. Not so friendly. Alexander Dickens: Iraq international squad vs. England's National Game XI (semi pros) at Macclesfield's Moss Rose. Brazil keeper Jefferson has been pretty much untroubled this afternoon, but he shows his concentration levels are still high by getting down to push aside Matias Fernandez's 25-yard free-kick. It looks as though the ball is bending just outside the post - but better to be safe than sorry. It hasn't been Neymar's day, but he's still trying. The Brazil forward runs into a phalanx of Chile defenders on the edge of the penalty area, and the ball pings out to Robinho, who volleys well wide. Chile's Mark Gonzalez, who had a brief stint at Liverpool just under a decade ago, is on for Eugenio Mena. Roberto Firmino has a chance for a second - and scuffs it. Willian and Danilo combine well down the right to find the Hoffenheim striker on the edge of the penalty area, but the finish is untidy and wide. There's another Chile change, with Eduardo Vargas replacing Arturo Vidal - and so we now have two QPR loanees on the pitch. Richard Smalley: I watched Bolivar win 5-1 in a league match in La Paz, Bolivia in 2005. What a strange game football is. Chile had all that possession, and didn't make any clear chances out of it. Now they are on course for a third defeat in four matches. This is not ideal preparation for the Copa America, which they will host in June. Brazil have brought on Chelsea's left-back Filipe Luis in place of Marcelo. The Arsenal fans in the crowd at the Emirates Stadium respond with some hearty booing. Brazil have been second best today - but they're in front thanks to one of their substitutes. Danilo plays a pass through the centre of Chile's defence, and Hoffenheim's Roberto Firmino times the run perfectly to go round Claudio Bravo and score. Chile respond by bringing on Matias Fernandez for Rodrigo Millar. Jorge Sampaoli's side have 17 minutes to deny Brazil an eighth straight win. Jonny: Gabon v Mexico at Coventry's Ricoh Arena. Craig, West Midlands: I watched a re-run of Dortmund v Juventus in Satin Dolls Dancing Club (the real-life Bada Bing from The Sopranos) just last Saturday. Roberto Firmino has a great chance to set-up a Brazil counter-attack - and wastes it by firing an over-hit pass that leaves Neymar sliding on to his backside as the ball whizzes out of play by the technical areas. Neymar, right now, may be wishing he'd phoned in sick today. For all Chile's possession, they're being restricted to long-range efforts from free-kicks. Alexis Sanchez has another go from a good 30 yards this time, complete with fast bowler's run-up, but keeper Jefferson holds on. Miranda gets caught cold by Alexis Sanchez, who is motoring towards the penalty area when he is dragged back by the Brazil centre-half. Miranda is booked. Sanchez waves an imaginary card almost before he hits the ground. For goodness sake, man, it's a friendly. Sanchez takes the free-kick himself, and lifts it over the bar. Toby: I saw the French Supercup, Lyon v Marseille, at the Red Bull Arena, in Newark, New Jersey, USA. Nick Ross: Vietnam v Brazil in Hanoi. Half the seats were double booked and Brazil won 2-0. Zac Woolfitt: Ecuador v South Korea (0-0) at Wakefield Highschool, Mass. World Cup USA 94 warm-up. Stood on pitch to watch the game. Four substitutions at the Emirates for Brazil - and that means a return to an English football pitch for Robinho. The former Manchester City forward, currently playing for Santos, replaces Liverpool playmaker Philippe Coutinho, who did not an awful lot in his hour on the pitch. Hoffenheim forward Roberto Firmino is on for Luiz Adriano, Elias has replaced Souza, and Willian has taken Douglas Costa's place. The sun's out now. It's making me feel a lot cheerier. Chile are on top in this game, at least in terms of possession, and they have a penalty shout rejected as Mauricio Isla darts into the penalty and goes to ground under Marcelo's challenge. There is, perhaps, a bit of arm-wrestling, but it's hard to tell who is the worst offender. Martin Atkinson refuses the Chilean appeals. With Brazl facing Chile in north London, we're asking: Where's the strangest place you've watched a match? Xavier from Ecuador: Watched El Clásico - Jumeirah Beach, Dubai. The actual beach. Sand and all. From Barrel in Southampton: Nigeria v Japan in Southampton. Rob in London: Barca v Arsenal in 2006 - on a ferry in the middle of the Bay of Biscay; on the way to see Wales play the Basque country. A nice bit of build-up from Chile. Arturo Vidal plays Mauricio Isla into space down the right, and the QPR loanee delivers a sharp ball in that Thiago Silva reacts well to clear. Pablo Hernandez makes progress into the Brazil penalty area and Fernandinho, in trying to shepherd the Chile forward out of play, gets into a tangle that leaves him in danger of conceding a penalty. Martin Atkinson is probably right not to give it. It's a messy challenge, though, in what is becoming a bit of a messy match. Thiago Silva, who is on a booking, goes in aggressively with a challenge on Eugenio Mena. Martin Atkinson gives the free-kick and nothing more. The referee might have a job on his hands to keep this 11-a-side. Torkil, Grimsby: Man City vs EB Steymur at Oakwell, Barnsley, 2008! Angela, Wigan: I watched Oman v Senegal in an Olympic qualifier at the Ricoh Arena in Coventry. All Wigan season-ticket holders got in for free as guests of the Omani FA! Well, maybe it will be better. Maybe. Alexis Sanchez makes progress into the Brazil penalty area with a terrific run, and tries to set up Rodrigo Millar, who can't quite dig out a shot. Joseph Panes: Watched England V Italy in the WC in Uganda. Two in the morning with hippos and elephants passing. Had armed guards! Fenning: Egypt vs New Zealand at Old Trafford for the Olympics. Alex J: Real Madrid vs PSG in Doha, Qatar and it rained! The players are out for the second half, and we're under way. It's going to be good, the next 45 minutes. Isn't it? Isn't it?! Dave Wagstaff: Brazil vs Jamaica at the King Power Stadium. Totnes&Dartington FC: Used to watch and play games at Channings Wood prison in Devon. Rhys: Italy vs Ivory Coast at Upton Park. The rain is absolutely teeming down in north London. In every sense, this is turning into a disappointing afternoon at the Emirates Stadium. David Igoe: Ghana v South Korea at Easter Road Stadium Edinburgh - 4,000+ Korean fans. Becky Ashton: I saw Rangers v Shelbourne in the Uefa Cup at Tranmere - it was moved on safety advice to a neutral venue and all hell broke out. That's right: Chile have beaten Brazil just seven times in 69 attempts. A decent chance to make it eight from 70 today, I would say. Matt in Wisley: Real Madrid vs Sevilla in the Cardiff City stadium in the Super Cup final was a weird venue. With Brazil and Chile meeting in north London, we're asking: Where's the strangest place you've watched a match? Jamal: Iraq vs Brazil in Sweden. Peter King: Nelson Mandela stadium in Kampala. Uganda v Nigeria - Afcon qualifier! Craig: Latvia v turkey on Monday in Latvia after Estonia away with England. Gary Medel's stamp on Neymar - unpunished by Martin Atkinson - is the big talking point of a half that was light on chances. Medel, to my mind, is fortunate that he is still on the pitch. Chile, though, have been the better side. Jorge Sampaoli's pressing game is giving Brazil little time to settle on the ball. Can they maintain it? If so, Chile would be my pick to win the game. Anyway, time for some more of your texts and tweets. Well, that was a feisty first half. Neymar hasn't been afraid to get stuck in during this first half, and referee Martin Atkinson's patience has finally snapped. The Barcelona man commits one foul too many by tripping Gonzalo Jara needlessly, and gets a booking. Chile are enjoying plenty of possession in the closing moments of the half. They're getting plenty of time to pass the ball around at the back, without so far finding the right pass to break down Brazil's defence. Where's the strangest place you've watched a football match? harryfre: Mexico v Ghana at Craven Cottage. Gabriel: Man Utd and Barcelona in Gothenburg. Alosha: Ukraine vs USA in Nicosia, Cyprus! And Dynamo Kiev vs Valencia also in Cyprus! Last five minutes of the first half. The game has opened out a little bit. Or at least, both sides are spending less time kicking each other and putting more effort into playing football. With Brazil facing Chile in London, we're asking: Where's the most unusual place you've watched a match? Joe Haynes: I watched Besiktas play Mainz 05 at Macclesfield Town's Moss Rose in pre-season, certainly a different experience. Dean Osborn: Chelsea v West Ham in a bar in Cuba. Douglas Costa suddenly gets free at the far post from Brazil as Marcelo's cross from the left catches the Chile defence ball-watching. The Shakhtar Donetsk midfielder has time - too much time, as it turns out, and lifts his shot into the stand. Poor. Ben Wainwright: Neymar clearly has so much talent, but spoils it all with play-acting. Yes, he was stood on. No, it did not require screaming. Kritt Normsaskul: A video referee could easily have alerted the referee of foul play and send Medel off. If only football was refereed like rugby. David Simon: Disgraceful by Medel. Instant video ref would put paid to all these incidents! Alexis Sanchez has had a busy old season with Arsenal, playing 3,326 minutes for them to date. He started on the bench against Iran in Austria on Thursday, and the energy he's showing suggests that the breather has benefited him. Chile playing some nice stuff around the edge of Brazil's penalty area. Dunga's defence, though, is holding firm. I can see why they've conceded only two goals in their last seven matches. Better from Chile. Alexis Sanchez starts a counter-attack with a superb turn, combining then with Mauricio Isla down the right to work a cross - from which Rodrigo Millar and Charles Aranguiz have shots blocked. Neymar swings in a lovely free-kick from the left for Brazil, and almost finds a breakthrough. Souza and Miranda both go for it but can't quite get a connection, and it drifts beyond keeper Claudio Bravo's post by centimetres. There must be a touch from a Chile player, because a corner is the result, but nothing comes of it. Kashmere Oris: There is nothing friendly about this match so far...crunchy tackles all over the place. Some words to describe the opening 25 minutes of this game: Competitive. Bitty. Scrappy. Fractious. Nothing to report in terms of chances, but there's a bite to the match. A kick. A sting. Neymar is writhing in agony after being challenged by Gary Medel. And on closer inspection, it's clear that there's a very naughty stamp by the Inter Milan man on Neymar. Martin Atkinson, who sent off Steven Gerrard for a stamp on Ander Herrera last weekend, has missed that one. Nick Comber: I once watched an international beach soccer tournament in Menorca. Eric Cantona was managing the France team. We're still waiting for the first shot on target at the Emirates Stadium. I'm going to make a prediction. Brazil will not lose 7-1 today. Meanwhile, Brazil centre-back Thiago Silva gets booked for a hack at Chile's Pablo Hernandez, who seemed to make more of it than there was. Lovely touch from Alexis Sanchez to get clear down the left for Chile. He has Arturo Vidal in the centre, but can't find the right pass, and Brazil centre-back Miranda steps across with great composure to clear. Brazil have won seven friendlies in a row since their 7-1 World Cup semi-final defeat against Germany last July (and the 3-0 defeat against the Netherlands in the third-place play-off). Abdul Asad: If Brazil lose, it'll be 7-1. Ronit Shakya: So they'll lose to Chile today and make it 7-1. Luke Hughes: If we lost 7-1 in a World Cup semi, it would have been a great tournament for us. Neymar seems fine after his clash with Miiko Albornoz a few moments or so ago, and is zipping around at full pelt again. Albornoz goes in with another poorly-timed lunge at Brazil's number 10, and receives the game's first yellow card. Chile, as usual, are playing a high-intensity, high-pressing game here. Alexis Sanchez has twiced tried to close down Jefferson on back passes. You wouldn't think this was a friendly. Referee Martin Atkinson, fresh from taking charge of last weekend's eventful clash between Liverpool and Manchester United, isn't happy with the ball here. There's a quick check to make sure it's been pumped up enough, and on we go. Chile played Iran in Austria on Thursday and now they're facing Brazil in London, so we're asking you - where's the most unusual place you've watched a football match? Ooh, nice touch. Brazil keeper Jefferson shows a nifty bit of footwork to elude Alexis Sanchez after being given a sharp back pass from Fernandinho. Straight to the other end we go, and Neymar is sent flying by a challenge from Miiko Albornoz. Alexis Sanchez gets a warm welcome from Brazil midfielder Souza, who brings him to the ground with a crunching challenge. Welcome to the game, son. We're under way in north London. Today's match is a home game for Arsenal forward Alexis Sanchez, who warmed up for the game by spending some quality time with his dogs, and posting a photo on Instagram. The one on the right has the leap of a top-class centre-back, by the looks of it. Brazil XI: Jefferson, Danilo, Thiago Silva, Miranda, Marcelo, Souza, Fernandinho, Douglas Costa, Coutinho, Luiz Adriano, Neymar. Chile XI: Bravo, Isla, Medel, Jara, Albornoz, Mena, Aranguiz, Millar; Vidal, Sanchez, Hernandez. Chile have been inconsistent since bowing out of the World Cup to the hosts last June. Jorge Sampaoli's side were surprisingly beaten 2-0 by Iran in Austria on Thursday. Today's match at the Emirates Stadium is their last scheduled match before they host the Copa America in June. An improvement is required. Dunga has remodelled Brazil since their World Cup humiliation. Strikers Jo and Fred have been moved out, as has goalkeeper Julio Cesar. Shakhtar Donetsk striker Luiz Adriano, the top scorer in this season's Champions League, has established himself in the attack. Atletico Madrid's Miranda has taken his chance in central defence. Botafogo's Jefferson is the new keeper. Some players remain: Fernandinho, Ramires and Luiz Gustavo have been kept on. But the new-look Brazil look to be getting back to their best, beating France 3-1 in a Paris friendly on Thursday. Luiz Felipe Scolari paid for that World Cup embarrassment with his job. For a new boss, Brazil turned to an old boss. Dunga was criticised heavily for Brazil's uninspiring displays at the 2010 World Cup. But since his return, they have picked up form, winning seven out of seven friendlies. Today they face Chile again - in north London. Belo Horizonte, 8 July, 2014. Brazil are one win away from a World Cup final on home soil. They haven't lost a competitive international at home in 39 years. A nation expects. Standing in their way: Germany. What followed was utter humiliation. A 7-1 defeat was Brazil's biggest at a World Cup. It was an embarrassment that shook a football-mad nation. Belo Horizonte, 28 June, 2014. Brazil and Chile are locked in a nerve-shredding penalty shoot-out in the World Cup's round of 16. Chile defender Gonzalo Jara steps up to take the final kick. He has to score.